First post, and a happy June to all. The time has come and I will finally be moving over to brand new editing softwares. Certainly may not be a big deal, despite that tools are tools, but having used Final Cut Pro 5.1 & 6 for six years and the ruckus that X has caused, this move shouldn’t shock. Despite the fact we use Final Cut Pro 7 at work, I chose to move away and edit with new software. I haven’t used Premiere since version 6, and have only did a small run with Avid, testing out the Capture Tool, frame rates and color correction. RetroDuo Core Edition and Super Retro Advance Adapter? That’s just a little extra I picked up on the gaming side (I’m a retro gamer). It is not shown but I picked up an NES ‘toploader’ console and was unaware of the “vertical bars” the signal casted on the games. Despite being a clone system, the Core should work fine (though it will leave my Dragon Warrior copy in the dust). I’d like an NES ‘toaster’ but the blinking screen has given me enough headaches, making my next possible purchase a reluctant gamble. A Famicom with 72-to-60 adapter? I’ll see. 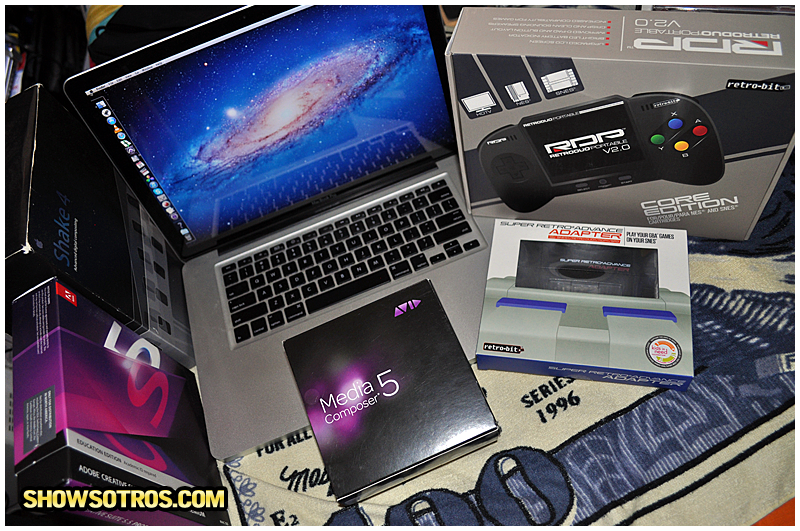 Nevertheless, I’m way overdue for a gaming-related review, so look for that on our website soon—Showsotros.com.